Blogust Day #13: My Favorite Workouts! Today is day thirteen of Blogust! To see all of the Blogust posts click here. Summer is the perfect time to get out there and sweat it up! Are you tired of your same old boring workout? Here are some of my favorites! I have started to really like yoga and pilates. I think it is so cool to be able to workout solely using your own body weight… not to mention you feel the burn! I highly suggest watching Blogilates and Tone it Up for the best workout videos! You won’t regret it. Let me just announce now that I HATE running. I don’t know what it is but I would rather jump off a cliff than go on a run. However, when you are with some friends it can be really fun. Pick out a nice area and go on a long walk or hike for a couple miles. Last fall my friend Julia and I went on a long walk throughout our town. We walked for about two and a half hours. The time flew by because we were chatting it up. We ended up walking more than seven miles! 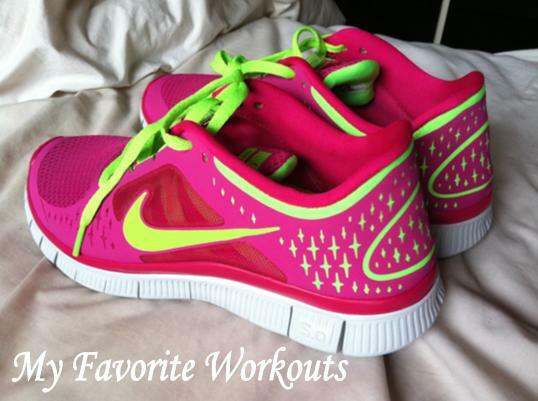 What are your favorite workouts? Any that I should try? My favorites too! And I just LOVE the shoes.